Leo Giordani is eighty years old and has not had a holiday in twenty-two years, yet he is the picture of vitality and good humour. 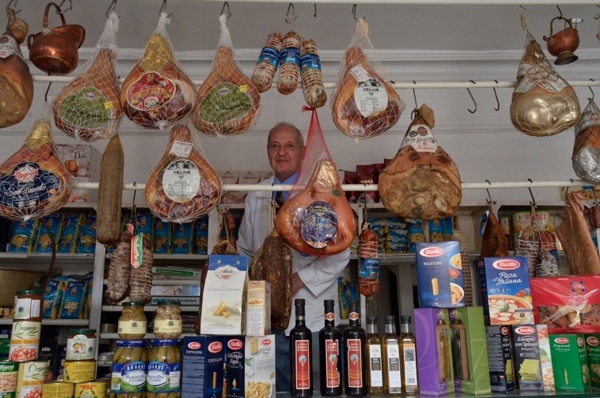 In his delicatessen in the Caledonian Rd, you discover a constant stream of loyal customers many of whom have been coming for three decades to exchange banter in Italian and cart off delicious salami, ham, sausages, olives, cheese, pasta, bread, wine and oil sold at his exceptionally reasonable prices. Clean shaven in collar and tie, and sporting an immaculately-pressed white coat, Leo stands with his hands clasped like a priest – surveying the passing world with a beatific smile. While the transformation of Kings Cross and its environs has taken place around him, Leo and his shop have remained unchanged – and all the better for it. 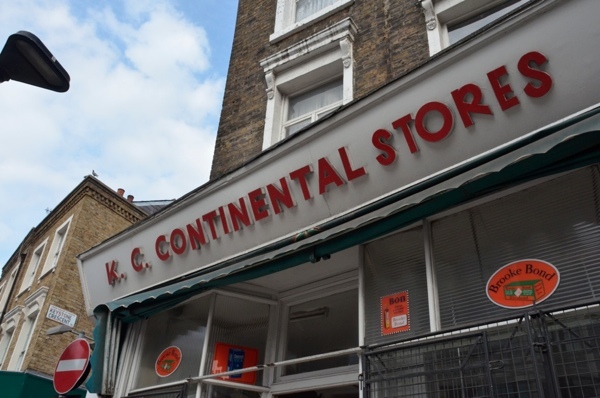 His red front door matches his hand-made three-dimensional wooden lettering, spelling out “K C Continental Stores” upon the fascia, which contrasts elegantly with the eau de nil tiles at ground level. Note the charming old glass advertisements for Brooke Bond Tea and PG tips before you step over the sunburst doormat into Leo’s realm. On the right and left, are glass-fronted cabinets displaying packets of pasta in every variety you could imagine. On the counter, sit freshly-made sausages and ravioli and mozzarella, while the walls behind are lined with shelves crammed with cans and bottles displaying brightly coloured labels in Italian. Straight ahead is a chilled cabinet of cheese while to the left is a chilled cabinet of salamis and suspended above all this are rails hung with a magnificent selection of hams and sausages. Taking avantage of the wooden chair, strategically placed for weary customers, I settled down to observe the drama as Leo greeted everyone personally and customers grew visibly excited at all the enticing smells and colours of the delicacies on offer – and, in between all this, Leo told me the story of his beautiful shop. “I opened Kings Cross Continental Stores on 1st October 1964, so I have been here forty-nine years. I came from Italy with my wife Noreena to work as waiters at the Italian Embassy but, after three years, the Ambassador went off to America so we stayed here. We knew about food but it took us a long time to learn how to run the shop and speak the language as well. I’ve always been very respectful with my customers, because you have to be good with them if you want them to come back. In those days, it was different here – better, because there were more shops, two fish shops, three greengrocers and a butcher. We had everything and now there’s nothing. There were plenty of Italians living here, Keystone Crescent was all Italian then, but the old people died and the young people moved away. My customers used to be more Italian than English, but now I get more English than Italian – yet the English know more about this food than the Italians these days. I have run this shop myself all these years, though sometimes my wife helped out with serving, cleaning and doing everything else that needs to be done. I get in here at nine each morning and I close at six because I’m not young anymore. For the last ten years, we have lived in Muswell Hill but I stay upstairs above the shop during the week while my wife is back in Muswell Hill picking up our grandchildren from school. Every night, I cook and wash-up for myself, and it’s a bit hard but I can make simple things like spaghetti. In spite of Leo’s threats of retirement, I think he will be there for as long as he can, so I encourage you to pop over to K C Continental Stores next time you are passing through. Leo can make you a sandwich of Parma ham or salami in ciabatta and reminisce about old Kings Cross. And I recommend you pick up some delicious fresh Italian sausages, olives and parmesan – as I did – while you are there, too. Wonderful shop, thank you for telling more people about it. I lived in kings cross before its gentrification and Leo’s shop was one of my regular haunts. It was and is a fabulous place to shop and a link to the strong Italian community which existed in the clerkenwell area. Were I not off to spend my day as a primary school teacher in Yorkshire, I would be hotfooting it to Caledonian Stores this lunchtime. Next time I am down, I’ll make a visit. Brilliant and cheery entry, GA.
We have been customers of Leo’s since 1997. His food is wonderful and he and his wife are lovely. Aw – this reminds me of the lovely Rocco who used to run Da Rocco on Highbury Park. That shop smelled heavenly from the pasta sauces they used to make. Must make a trip here now that he’s gone. Wonderful shop; I can smell the cheese! Thanks for letting us know about this gem. Definitely going to go and buy something nice there – looks wonderful. We’ve been customers since 1993. Delightful shop. Delightful people. 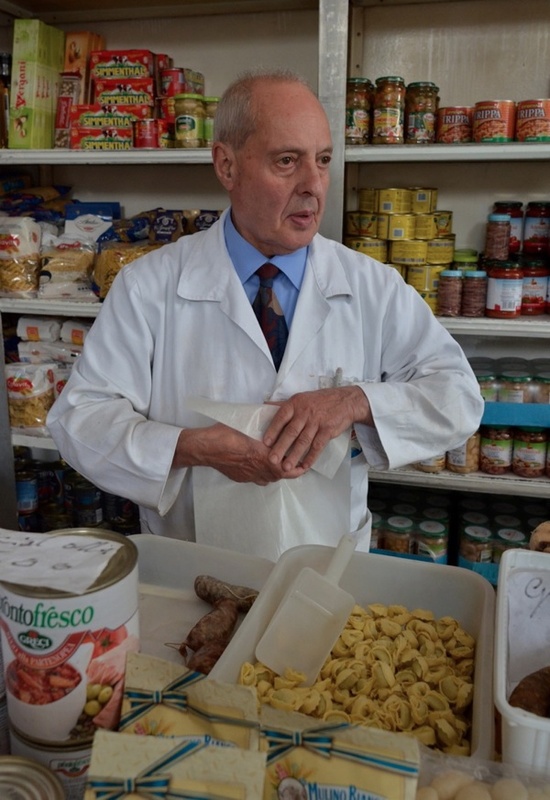 This is a traditional italian delicatessen which has been running for 50 years, my grandmother, mother and now I shop here regularly. The food is excellent and all reasonably priced! I would recommend this to anybody; it is a little gem. Leo and Norina are fabulous people and will do anything to help you buy the right ingredients for a fantastic italian meal. Leo’s shop is unique. Even in Italy, such a shop would be a rarity nowadays. Things are not what they use to be and I can understand when Leo states that English people know more about Italian food that the younger Italians do! Quality and flavours are less understood. Its true! Very True. Leo has the ability to get the most wonderful salami or hams. Christmas would not be Christmas in our house without Leo’s (specially selected ) ham…properly seasoned and dried! 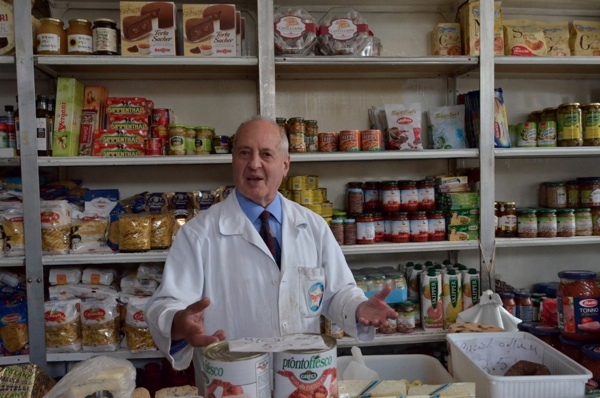 his Felino salami is second to none…(where does he find them!! I always wonder..). I hope that Leo doesn’t retire. Retiring is a concept that doesn’t fit in with him, or me for that matter, that is probably why we are such good friends. I can only speak for myself, but I know Leo would agree, that the best way to pass away is doing what you love the most….your work. Leo loves his work, that is why he doesn’t need a holiday and I celebrate this!! Long live the King Of Delicatessen, Long Live Leo!! I called in,before returning home and got talking to Leo and his son. I bought cheese,salami etc.and have been friends ever since. So each time I go match in London,I go home with food from Leo. We discovered KCS 8 years ago and we name our pasta sauce after it (‘KC sauce’) because you cannot get better sausages for pasta. We will be very said when Leonardo retires: his is our favourite shop in London and there will never be another like it! Good quality food honest prices! Lovely article about a lovely man and his shop. I was somewhat alarmed for its (and his) welfare, though, when I visited during a downpour. Rainwater fell through gaps into the shop, and buckets had to be produced. If Camden is the landlord it doesn’t seem to be doing much of a job keeping it in good repair. Surely something could be done to help? So I was in and heard that he is finally shutting up shop at the end of this month April 2015. So please go in and buy some stuff. 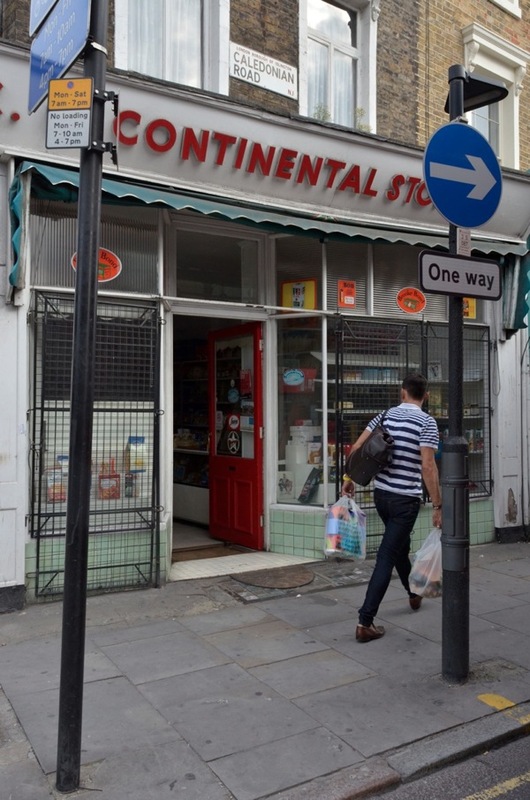 I went to Continental Stores and found it empty. It looks like Sig. Leo has finally retired. He was such a lovely man, a real gentleman, and I am so sorry to see the shop empty after so many years. Molto Grazie, Signor Leo. Buon riposo. My late father used to shop at “Leo’s” at least once a week – usually on a Saturday morning – from not long after Leo’s shop opened until he retired about 15 years ago and then only ventured there occasionally, but he got to know Leo well over the many years. The long-established Italian community in the Clerkenwell/King’s Cross area was already in significant decline in the 1990s as cafes and restaurants closed when descendants no longer wished to continue family businesses that were probably no longer financially viable. Now it has virtually disappeared completely. Leo’s shop was one of the last landmarks. Leo always had a friendly word for all his customers and above all the quality of the food was always superb. I was last in the area before Xmas 2014 and popped in to buy a few things to take up north with me. Having returned to King’s Cross for the first time since a couple of weeks ago I was very sad to that Leo had left. A temporary pop-up gallery occupied the premises. You are and will be much missed Leo – thank you. I hope you have a happy retirement. I shopped here from the age of 18 having been brought here by an Italian friend. Indeed, the first bottle of bear I bought from a shop, not a pub was from here and I drank it along the canal to Camden Lock. When ever I was in the area I would visit and buy a pound of super strong cheese from an enormous round cut with a huge knife..
Later I worked in the area and would frequently shop there for unusual pastas, cheeses, salamis The shop owner whom I now know to be Leo would make me the most exquisite and huge ciabatta sandwiches of cheese ham and tomato. I would always buy my Pandoro and Panettoni there around Christmas time. and we would always chat about how each others vegetables were growing that year. He bought his house in a development I looked at, but I bought elsewhere. It would have been nice if I had bought in Muswell hill near to Leo. I hope his tomatoes are doing well this year.